Previously: Moose and Stephan Bonnar invaded the American Top Team facility and destroyed it with metal pipes. Tonight: Bobby Lashley and ATT address Impact Wrestling. 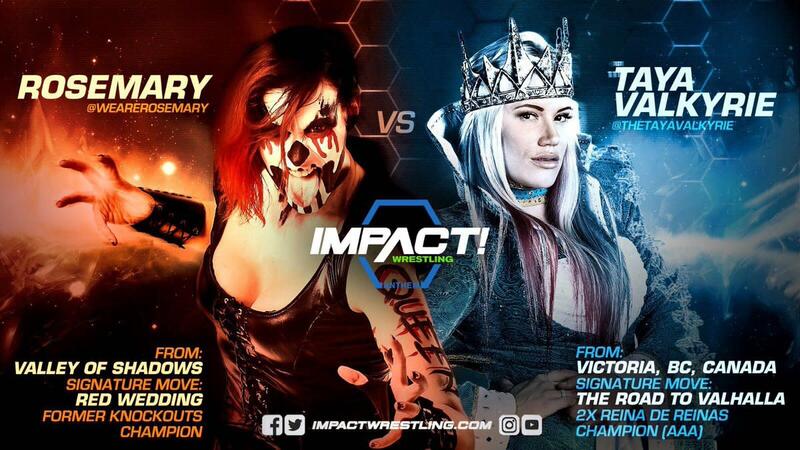 Plus, Taya Valkyrie faces off with Rosemary. Impact had a flurry of offense early on, but Adonis took over with a bear hug and a spinebuster. Adonis locked on the Adonis Lock before Impact leaped over the top rope while still in the hold to break it. Impact made a comeback and hit the Countdown to Impact for the win. Eli Drake ran out and tried to attack Impact, but Impact got the better of him. He ripped off Drake’s clothes and stripped him down to his boxers. Adonis then jumped Impact from behind and they beat him down until Garza Jr. ran out for the save with a chair and the heels ran off. This was supposed to be every man for himself, but the Impact guys worked together against AAA at the start. The Impact wrestlers isolated Fantasma before he made a comeback and scored a close near fall. Storm had the match won until EC3 pulled him off and they ended up fighting. Texano tried to convince Storm to attack Fantasma’s father (who was on commentary). Fantasma went after Storm and Texano snuck in and scored the pin on EC3. - OVE returned to Tijuana and The Crash in search of LAX. Konnan will only talk to them if they defend the tag titles tonight. - James Storm and EC3 blamed each other for the loss earlier. Edwards was angry that they couldn’t work together. Edwards is going to Japan, but he ordered Storm and EC3 to work together next week. - In the back, Jim Cornette and Dan Lambert had a heated argument. Lee interfered early to give the advantage to Everett. Xavier was able to make a comeback and hit a dive to the floor. Lee distracted Xavier and Everett hit him from behind. Xavier then made another comeback, hitting a backflip into a kick for the win. - During the last match, Josh Mathews announced that Taryn Terrell is out of the Knockouts Championship match at Bound for Glory. He noted that doctors wouldn’t clear her after the slap from Gail Kim last week. It will now be a triple threat between Sienna, Kim, and Allie. - Grado came down to the ring and called out Joseph Park, accusing Park of cheating him out of money. Park reminded Grado that he owns his visa. He challenged Grado to a match at Bound for Glory. If Grado wins, he stays. If he loses, he’s gone forever. Grado signed the contract and went to leave but Park stopped him. Park revealed the match will be a Monster’s Ball and it will be against his “brother” Abyss. Grado jumped in his car and tried to leave but the car wouldn’t start. Abyss’ music played and Father James Mitchell appeared in the back seat. Grado ran off terrified. Black Diamond caught OVE with a dive to start the match. Jake Crist charged Danger, but he caught Jake and threw him up. Diamond then came of the top rope with a spear on Jake. OVE made a comeback and used a variation of the Meltzer Driver for the win. - Jeremy Borash was in the ring when Dan Lambert and American Top Team came through the crowd. Lambert has watched Lashley waste his MMA career for pro wrestling. Lambert said he’s the biggest pro wrestling fan and knows more about wrestling than anyone. He then showed off some of his wrestling memorabilia, including Bruno Sammartino’s original championship belt from the 1960s. Lambert was upset that Moose and Stephan Bonnar invaded the ATT gym. He challenged Moose & Bonnar to fight Bobby Lashley & King Mo at Bound for Glory. Moose and Bonnar came out with the belts and trophies they stole last week. As they made their way to the ring, Lashley jumped them from behind. ATT beat them down with Lashley giving both a spear. Mahabali Shera, Caleb Konley, and Andrew Everett tried to help but they got beat down as well. - In Tijuana, OVE confronted Konnan and demanded their pay. A bunch of Crash guys surrounded the ring and attacked OVE. - On Global Forged episode six, the search for new talent continued as the competition heats up. Rosemary had the early advantage until Valkyrie took over by ramming her into the ring post. Valkyrie caught Rosemary with a crossbody press to the floor. She missed a knee in the corner and Rosemary countered into a German suplex. Rosemary set up for the Red Wedding, but Valkyrie countered into a Northern Lights suplex and hit a double stomp for the win. Valkyrie tried to give Rosemary the Road to Valhalla after the match, but Rosemary spit the red mist in Valkyrie’s eyes. Rosemary challenged Valkyrie to a match at Bound for Glory and said it’ll involve blood. She then shouted “Bloody Mary." Next Week: X Division Champion Trevor Lee defends at The Crash in Tijuana.